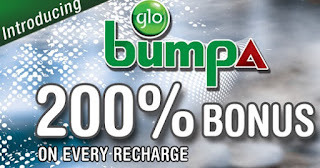 Earlier in December 2013, Glo unleashed another "bumpa" tariff plan called glo Bumpa, this tariff plan gives subscribers 200% bonus upon recharge of credits from as low as #100. This new tariff plan is coming at a time Glo customers like me are yet to get enough of the Glo Bounce tariff plan which is targeted at youths and students that just want to get the best value for their money. 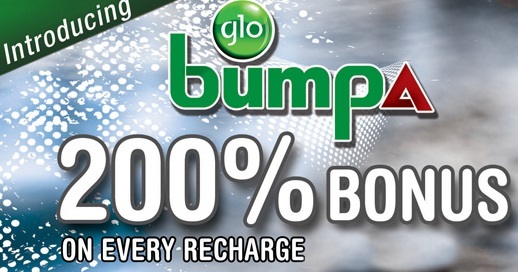 The Glo bumpa tariff plan allows you to make calls to ALL networks at a flat rate of 50k/sec. The Bonus credits you get on recharge can be used to make calls across the country, SMS and browse the internet. Bonus is valid for 30 days. SMS will be charged at a flat rate of #4 NGN per sms to all networks in the country and #10 NGN to foreign lines. Make Free night calls to Glo lines. And lastly, the Glo Bumpa tariff plan is available to all new and existing glo subscribers. To migrate to Glo Bumpa tariff plan, simply dial *100*10*1# then press 1 when prompted to confirm migration. I subscribed lately but did not receive any bonus after recharge.